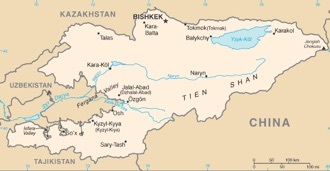 Kyrgyzstan : When and where to go? Continental type, the climate of the country can be very contrasted because of the omnipresent mountains: it knows a very cold and dry winter, with a strong wind in mountain, and hot summers, especially in the south. The best times to travel are from April to June and in September / October if you do not climb to the top. For the mountains, it is summer that must be chosen. One of the best ways to discover the country is the equestrian hike, which will allow you to explore countryside and mountains: one of the must-see sites, Lake Issyk-Kul, in central Kyrgyzstan, surrounded by meadows where locals install their Yurts during the summer, and you can even lend one for a stay among them. Another beautiful location is Altyn Arachan, with its warm springs and magnificent landscapes, including the well hidden Ala-Köl lake, which will be a sumptuous setting for an unforgettable trek. As far as the cities are concerned, visit Bishkek, the capital, with its History Museum, the Museum of Applied Arts and the famous Osh, huge and labyrinthine bazaar, which has existed for many centuries. the Silk. In Karakol you will see the cattle market which takes place every Sunday morning, but also the Chinese mosque and the Orthodox church. Discover also the village of Arslanbob with the largest forest of walnut trees on the planet, where you can hike among the flowering trees. French nationals do not need a visa to enter the country. The current currency is the som (KGS). You will arrive by plane to the airport of Bishkek, via Istanbul, Dubai, Kiev or Moscow. To move around the country, there are buses and especially minibuses, and collective taxis. We can also hire a car in Bishkek with or without a driver. Regarding your budget, you will pay between 20 € (for the inhabitant) and 100 € (chic hotel) for a one night accommodation for two; To eat, you can spend less than 5 € per person in the markets, less than 10 € in a local restaurant, and about 15 € in a more chic establishment. Health: There is no compulsory vaccine but it is better to have its universal vaccinations up to date and to add those against hepatitis A and B and against typhoid, as well as that against rabies if you have to be in contact with animals. Consider taking away mosquitoes, and do not drink tap water. An antidiarrheal treatment may also be necessary. Attention, AIDS is very present, have condoms in your luggage. Security: There are still some scattered areas of tension after the 2010 conflicts, so it is advisable not to take part in crowd gatherings. Avoid strolling at night in Bishkek, and venture alone in the mountains. It is mainly the consumption of vodka that can lead to aggressive or violent behavior, otherwise the population is incredibly warm and hospitable. Shopping: the madmen of Lenin will find all kinds of objects to his effigy, the others will bring back objects of terracotta, silk scarves, animals and miniature yurts in felt.